The SiS163/163U is a single-chip wireless LAN Medium Access Controller (MAC) and Baseband processor (BBP), which fully provides the feature and functionality needed for the MAC protocol of IEEE 802.11a/b/g standard. The SiS163/163U applies the innovative MAC and Baseband core engine architecture and is designed to provide good performance with minimum power consumption and enhance the advantages of robust system and cost-performance effectively. It is targeted at competitive price-performance, better power management, high volume mobile PC module, PCMCIA adapter card, Compact Flash module, USB 2.0 dangle and build-in notebook system. 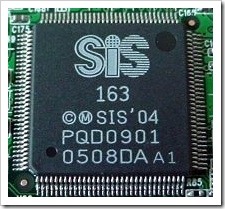 The SiS163/163U chip contains a 16/32-bit host bus interface which is compliant with Cardbus v7.1, Compact Flash v1.4, Mini-PCI v1.2 and PCI v2.3, a MAC core unit, BBP core unit, WEP,TKIP and AES encrypted engine as well as a physical attachment interface (PAI). Additionally external interfaces include serial EEPROM, GPIOs, LEDs and radio control. To update the driver, just run SETUP.EXE directly. SETUP will overwrite the old driver with the current one. Please make sure the SiS162 Wireless Card has been plug in on slot before you run SETUP.EXE. Download, Unzip, open the device manager and update the driver for unknown WLAN Adapter.